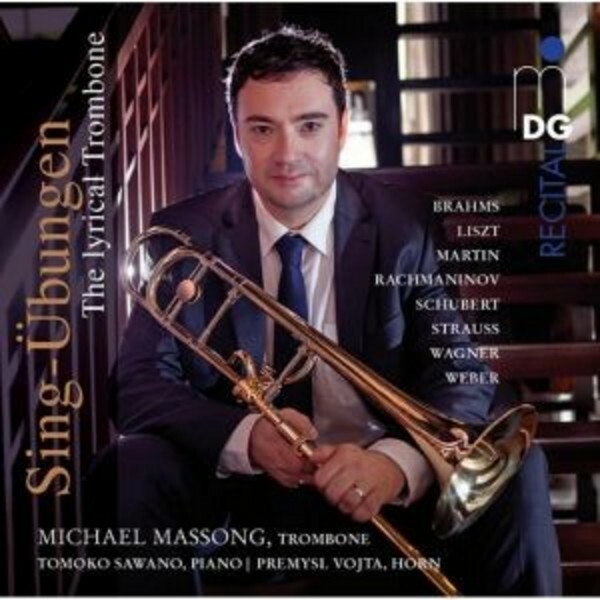 'Sing-Übung' is the name given by Michael Massong to his debut recital on MDG: lyrical pieces, in large part especially arranged for this CD, display a vocal quality of trombone playing that is without equal. The selection of works also holds some surprises in store: Rachmaninov's famous 'Vocalise', the fine emotion of Carl Maria von Weber's 'Romanze', and Franz Liszt's 'Romance oublié', in which Michael Massong teases previously unheard-of vocal expressive depth out of his instrument. The prizewinning horn player Premysl Vojta performs the duo part in 'Singübung', the title work by Franz Schubert, and in the four duets by Johannes Brahms. Michael Massong is a genuine globetrotter. Born in Germany, he studied with all the greats of his instrument in Frankfurt, London and New York, and travels around the globe for master classes and solo performances. In order to meet his high demands, he has developed his own series of alto and tenor trombones in cooperation with the Thein brothers. The result makes for fascinating listening: a multifaceted instrumental portrait guaranteed to please brass fans everywhere!